Tausug (Tausug: Bahasa Sūg, Malay: Bahasa Suluk) is a regional language spoken in the province of Sulu in the Philippines, in the eastern area of the state of Sabah, Malaysia, and in North Kalimantan, Indonesia by the Tausūg people. It is widely spoken in the Sulu Archipelago (Tawi-Tawi), Zamboanga Peninsula (Zamboanga del Norte, Zamboanga Sibugay, Zamboanga del Sur, and Zamboanga City), Southern Palawan, Malaysia (eastern Sabah) and Indonesia (North Kalimantan). Tausug and Chavacano are the only Philippine languages spoken on the island of Borneo. 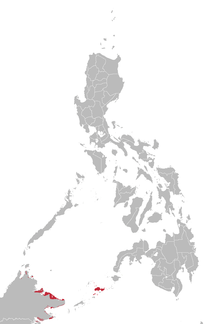 The Tausug language is very closely related to the Surigaonon language of the provinces Surigao del Norte, Surigao del Sur and Agusan del Sur, and to the Butuanon language of northeastern Mindanao. The name of the language in Tausug is Bahasa Sūg ("language of Sulu"). Tausūg is derived from two words: Tau ("person") and sūg ("current"), presumably referring to their economic livelihood that depends on the strong currents of the Sulu Sea, where they used to trans-navigate as fishermen, pearl divers and traders. Even today, the Sulu Sea is still the strategic trade route of the southern Philippines and the nearby ASEAN nations. As early as the 10th century, the trade route between Sulu and China and North Borneo is believed to have been already flourishing. The people in the area were known as the "people of the current", the literal translation of "Tausūg". Features: Vowel lengthening (e.g. bāy 'house'). Stress: Nonphonemic stress on final syllable. There is also an unstressed sound [ə]. The letters o and e are used in loan words and names from other languages. It is alleged that the Tausug language was previously written in a Baybayin-related script called "Luntarsug." The former Sultan of Sulu appears to have confirmed this view with physical evidence. The Tausūg language was previously written with the Arabic alphabet. The script used was inspired by the use of Jawi in writing the Malay language. The Arabic script used to write the Tausug language differs in some aspects to the script used for the Arabic language and in the Jawi script used for Malay languages. One of the main differences is in the way that word-initial vowels are written. In Arabic, /in/ is (إن); in Jawi (Malay), it is (ان). In Tausug, it is (ئِن). The Tausug Arabic script utilises the letter yā' with a hamza to represent a short vowel. If a kasra (ِ) is added, it becomes an 'i' sound. If a fatha (َ) is added, it becomes an 'a' sound. If a damma (ُ) is added, it becomes a 'u' sound. Who is your father? Hisiyu in ama' mu? What is he doing? Unu in hiyhinang niya? Where are you? Hawnu kaw? or Hariin kaw? Why are you crying? Mayta' kaw nagtangis? When are you arriving? (future) Ku'nu kaw dumatung? When did you arrived? (past) Ka'nu kaw dimatung? How did you know that? (process) Biya'diin ka ingat mu? How is Hamid? (condition) Maunu-unu na hi Hamid? Many Tausug words derive from the Arabic language. ^ Hammarström, Harald; Forkel, Robert; Haspelmath, Martin, eds. (2017). "Tausug". Glottolog 3.0. Jena, Germany: Max Planck Institute for the Science of Human History. ^ a b c d see Tan, Evangeline K. (1967). "The phonology of Tausug: a descriptive analysis". open.library.ubc.ca. M.A.Thesis, University of British Columbia. p. 16. ^ a b Jawali, Hamsali S. 2006. Ta'u-sug–English–Tagalog Dictionary. National Bookstore: Mandaluyong. Tausug-English Dictionary of SIL International. online version accessible from Webonary.org.